Row 1 (Wrong side): K2, * p5, k3; rep from * to last 7 sts, p5, k2. Row 2 (Right side): K2, * sl 5 wyif, k3; rep from * to last 7 sts, sl 5 wyif, k2. Row 3: K2, * p5, k3; rep from * to last 7 sts, p5, k2. Row 4: K4, * k1 uls, k7; rep from *to last 5 sts, k1 uls, k4. Knit: K | Purl: P | Slip stitch as if to purl: Sl | With yarn in front: Wyif. Knit 1 under loose strand: K1 uls. Insert right needle under loose strand and then into next stitch knitwise, from front to back. 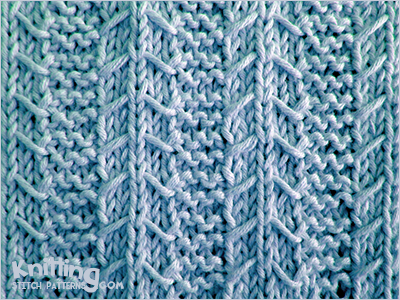 Knit stitch normally then bring new stitch out from under the strand.